Men – in all their diverse groups, settings, lifestyles and stages of life – can face considerable challenges to their mental wellbeing from specific cultural and societal factors, causing difficulties for themselves and those who live and work with them. In addition, these men may respond better to certain approaches and treatment. Promoting Men’s Mental Health outlines the breadth of the challenges and provides guidance for those working in primary care on targeting and helping men who need support. Good mental health is more than the absence of mental illness, and this book therefore highlights methods to promote positive mental health by increasing psychological wellbeing, competency and coping skills, and by creating supportive living and working environments The book highlights examples of best practice throughout the UK, Europe and America, and will be essential reading for primary care and mental health professionals, and all those with an interest in men’s mental health. ‘We need to be more innovative in the way we try to reach men. 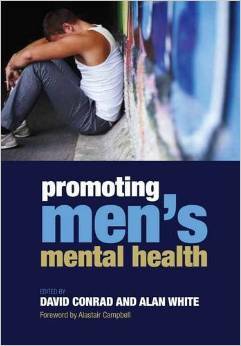 This book will help stimulate further discussion and hopefully encourage men to seek help or support.